..".she drove her right fist three inches deep into my solar plexus, putting her entire 102 pounds behind the blow. I retreated a full foot but remained on my feet. I gasped, treasuring the oxygen remaining in my lungs, and knew that little more was likely to enter there for some time. I wondered how long a person could live without breathing. More so, I wondered how long I could convince my sixteen-year-old daughter that I was unfazed by her puny blow." In this hysterical, irreverent and sometimes thought-provoking collection of essays, the author takes us on a journey through everyday, real-life events that start out as uneventful, but that wind up being anything but. 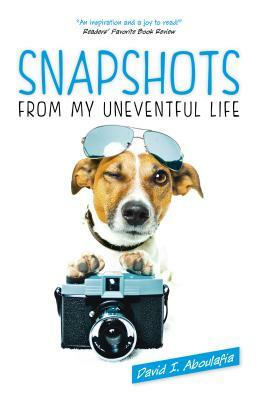 'Snapshots' is a book that everyone will identify with, and that will have you holding your stomach with laughter. David I. Aboulafia is an attorney with a practice in the heart of New York City. He spends the wee hours of the morning writing books that terrify and amuse. His days are spent in the courts and among the skyscrapers, and his evenings with the trees, the stars, his wife and his dog in a suburb north of the City.